We had a small accident in our kitchen a while back, where our deep fryer got melted on the stove (pleasures of having small children 🙂 ). Luckily, we have a good insurance, and got all the money back to buy a new one. However, since we bought the machine a few years ago, it seems deep fryers are not sold any more. 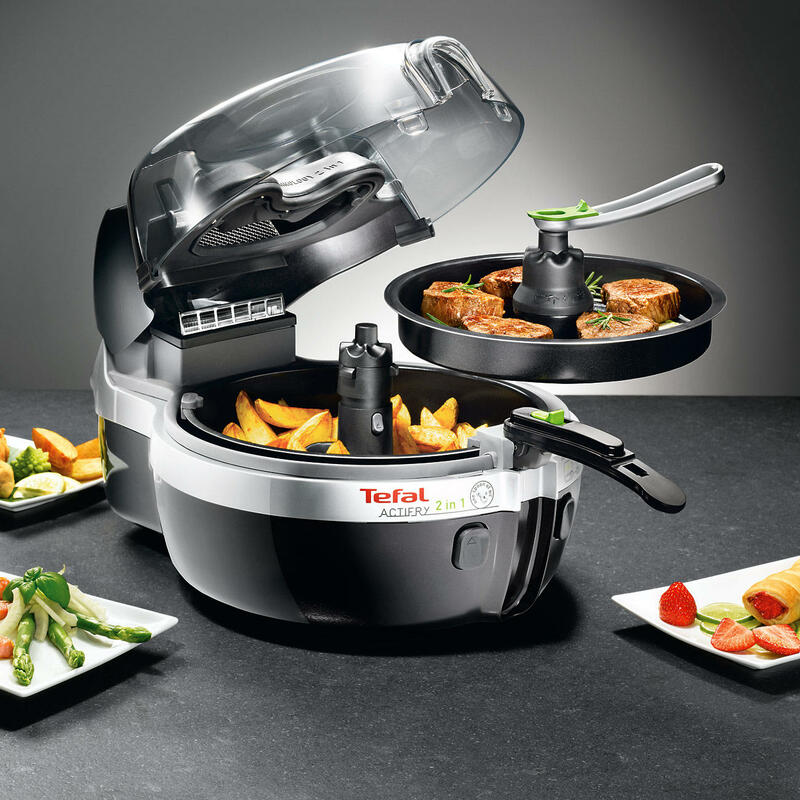 Instead the big thing now is a combination of hot air and very little oil (only a spoon) – Tefal seems to be the best on the market with their Actifry series. The top model – the 2in1, can even make the rest of your food in a second pan on top of the one you make the fries in. Needless to say, I was very sceptical about this whole thing. How could Pommes Frittes be any good with only a spoon of oil?? I used some time to watch videos on Youtube and got convinced that maybe this hot air thing wasn’t just hot air after all. I decided to buy one, and today we got it in the mail. 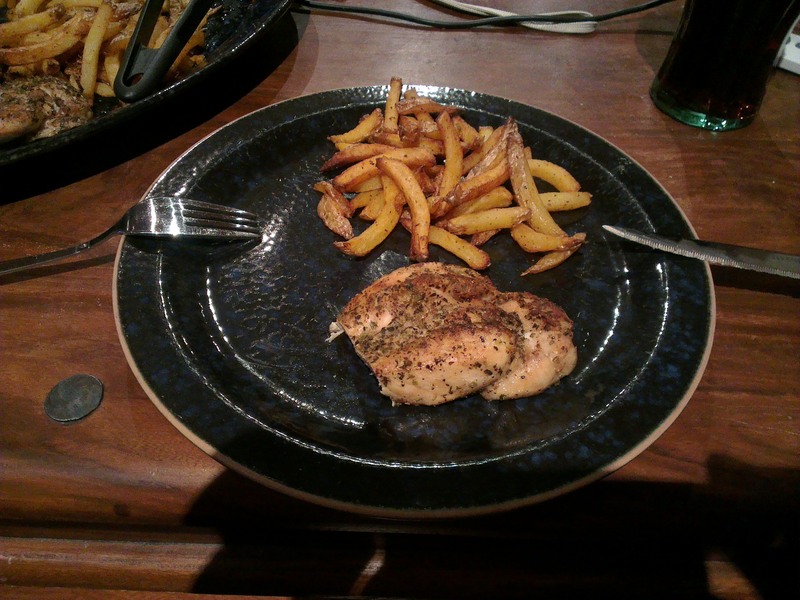 Our first meal was home-made pommes frittes and chicken breasts. The recipe said to cut up the potatoes into fried (with the included cutting-device), put it in the bottom pan, put on salt/pepper (and I added some paprica) and one spoon of oil. Then set the timer for 50 minutes and choose 2in1 and tell it that the top pan was going to be chicken and be fried for 20 minutes. Then it started, and when it was 20 minutes left it stopped and asked me to insert the top pan. In that pan I had put the chicken breasts, with a lot of salt/pepper/provence spices on. It started again, and after 20 more minutes, the food was ready. As you can see from the pictures, it was all good. 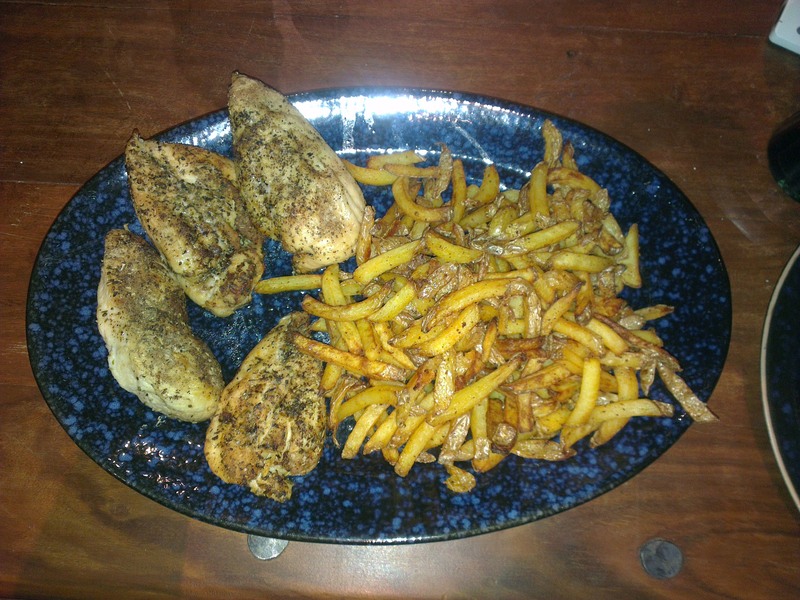 I have never tasted so tender and good chicken before, and the fries were amazing. This entry was posted on 10/20/2013 at 00:51 and is filed under Uncategorized. You can follow any responses to this entry through the RSS 2.0 feed. You can leave a response, or trackback from your own site.